Before we talk about how to treat allergies, it’s best to understand what they are and how they come about. There are many different forms of allergies, but the allergies we started seeing a few weeks ago with the warmer weather are related to pollen. Starting the last two weeks in March until June, tree pollen is the biggest culprit. In Central Oregon, those Juniper trees that smell so great after a rain storm can blow up and spew enough thick yellow pollen to coat everything. The symptoms can be miserable: sneezing, itchy/runny eyes and nose, swelling, redness (even blistering of the eyes if rubbed), hives, mild fever and fatigue. All of this probably leaves you looking for the license plate number of the “Allergy Truck” that ran over you! The term allergy applies to an abnormal reaction by your immune system to substances that are usually not harmful. These substances, often called antigens, are the “allergenic triggers” and can come from food such as peanuts, wheat or dairy, or environmental substances such as pollen, dust, mold or hay. 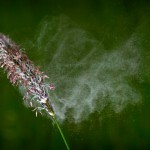 These things cause no problem for the vast majority of people, so why do they wreak such havoc on allergy sufferers? 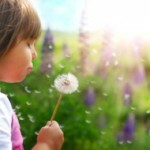 Researchers are not sure what causes the development of allergies, but heredity does play a role. A normally functioning immune system protects the body from foreign substances by producing antibodies and other chemicals to fight against them. Usually the immune system ignores harmless substances, such as food and pollen and fights only dangerous ones, such as bacteria. However, the allergic person’s nervous system and immune system have learned inappropriate and exaggerated responses to ordinary things. Once a person develops an allergic reaction, the immune system overreacts and releases chemicals like histamine to attack a harmless protein as though it were a threat. Histamine produces many of the symptoms associated with allergies, and there are hundreds of proteins that may trigger allergic reactions, from pollen, food and pet dander to prescription medications. Now some of you at this point are saying, “Dr. Hanes, I just want some natural things that are going to help me get through this allergy season” – I get that! There are numerous herbs and supplements that can help with allergies including raw local honey, Bragg’s Apple Cider vinegar, stinging needle, bioflavonoids, homeopathics and using a Neti pot. For those of you that are really serious about getting to the bottom of your allergies, look for my upcoming Part 2 of this article. Vitamin C: high dose (2,000 mg or more) in the form of a mineral ascorbate, along with bioflavonoids. Quercetin – one such flavonoid and also an antioxidant is thought to reduce histamine (Dose 200-400 mg per day). Vitamin C has antihistamine properties and has been shown to stabilize mast cells, the cells responsible for releasing histamine. Omega-3 fatty acids: According to one German study published in the journal Allergy, people who have diets rich in omega-3 fatty acids suffer from fewer allergy symptoms. Another study found that children who regularly ate fish prior to age one had much lower allergies by age four. Omega-3 fatty acids come from cold water fish (wild, not farmed). Flaxseed oil is high in the omega-3 fats but lacks the DHA in fish oil. Only supplement with a high quality fish and flaxseed oil from a reputable source. Probiotics: While I have not found them particularly helpful during acute allergy symptoms, they are an essential part of any comprehensive holistic strategy. A 2008 study showed that people who took probiotics throughout the allergy season had lower levels of an antibody that triggered allergy symptoms. They also had higher levels of a different antibody (IgG), thought to play a protective role against allergic reactions. There is also evidence that giving probiotics to newborns and mothers-to-be may help prevent childhood allergies. Vitamin D: Again, this is not to stop your acute allergies but is part of any holistic strategy. There are numerous studies showing that adequate Vitamin D helps regulate immune function and can help reduce allergic responses. Everyone should have their 25, hydroxyl Vitamin D level tested and aim for at least a blood level of 60 ng/dl. Local, Raw Honey combined with Bragg’s Apple Cider vinegar (with the “mother”): One heaping teaspoon of local raw honey, one teaspoon (or more) of the vinegar mixed with 6-8 ounces of warm water. I have found this tonic to be quite helpful. Locally produced honey contains pollen spores from local plants. It is thought to work as a natural allergy remedy by introducing a small amount of allergen over time which builds up your natural immunity. A word of caution: Local honey can aggravate allergies and even cause anaphylaxis in a small number of individuals, and it is also high in fructose. Homeopathics: There is also one particular brand of homeopathic that I have found particularly useful, especially their nasal spray. Call or stop by and I can give you the name. It is not one I carry right now and has been back ordered for some time so I hesitate naming it here. General medical recommendations are to avoid the offending allergen, eliminate carpet, mop and dust often, change bed linens more frequently and use an anti-histamine when the symptoms become too much to bear…all good recommendations to treat the symptoms, but they do not address the root causes. Not only that, it’s awfully hard to get away from those darn Junipers in Central Oregon. Please – share your thoughts on this article, and if you have a “magic combination” that works well for you, please share that also! Remember, nature already created a cure before any harsh drugs were thought of…you just need to find the combination that works best for YOU. In our follow-up article, I will go deeper into the root causes of allergies and our exclusive protocol for successfully eliminating many allergies and sensitivities. A drop of therapeutic grade lavendar essential oil under the tongue to relieve acute symptoms. Tastes awful, but works to stop the runny nose and itchy eyes.